Is it ever right to refuse to submit to a governing authority? Listen to this lesson to learn what the Bible has to say about authority orientation. Hear biblical and historical examples of those rightfully committing civil disobedience when either told to do something the Bible forbids or forbids what is mandated in the Bible. Find out whether the Founding Fathers were justified in not submitting to the King of England. Does God only expect us to respect the office but not the one holding the office? The answers to some of these difficult questions may surprise you. Dr. Dean referenced an article by David Barton entitled “The American Revolution: Was it an Act of Biblical Rebellion?” during this class. What does grace orientation have to do with our response to authority? Listen to this lesson to see that Jesus is our major example of submission to unjust authority. Hear the only exception to obeying legitimate authority. When faced with unjust but designated authority, do not look for wiggle room or an escape clause or you will be resisting the ordinances of God. Do Christians have to quit sinning before they can live the Christian life? Listen to this lesson to learn that because of our sin nature we will never completely cease to sin, but that God’s grace is available for confession of our sins. See that since we are part of the family of God our behavior should not be habitual sinning. Find out the meaning of "flesh" and see who the beloved are. 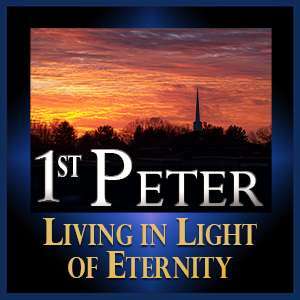 Listen to Peter’s exhortation that we live a spiritually responsible lifestyle. During this class Dr. Dean mentioned an article published on AmericanThinker.com entitled "The Death of Evangelicalism." What does it mean that all Christians are priests? Listen to this lesson to see that when we trust in Christ He is our High Priest and we all function as priests. Hear about the earliest priests in the Age of the Gentiles. See that priests are intercessors. Learn about the duties of the Levitical priests and all that involved, including the qualifications. Understand that the rules they followed were designed to teach spiritual lessons to the people and pointed to the priesthood of Jesus Christ. Because Christ is royal, we are royal priests and have the privilege of offering spiritual sacrifices to God. Why is Christ called a stumbling stone? Listen to this lesson to learn that those who rejected Christ as the Messiah were offended by Him. Find out that just as God called Israel to be special and they were to let the nations around them know about God, so Christians in the Church Age are royal priests who are to proclaim the gospel to the world. Understand that the most important thing in our lives today is to serve God so we will be trained to rule and reign with Him in the future kingdom. When we make sacrifices to God does that mean we have to give up something for Him? Listen to this lesson to hear five points on what makes acceptable sacrifices to God, including praise and singing. See how these sacrifices involve the Holy Spirit and our priesthood. Find out how the Messiah has become a stumbling stone to some men but is special or choice in God’s eyes. See how those who trust in Christ as their Savior become living stones. Is there any difference between believing Jews and all other believers in the Church Age? Listen to this lesson as Peter applies verses from the Old Testament to the Jewish believers he is writing to. Find out nine things about the living stones in this passage and who the Chief Cornerstone refers to. Review four ways Old Testament passages are used in the New Testament. Take time to appreciate the many blessings both Jewish and all other believers share which are given them by the living God. Are all believers part of the Royal Family of God? Listen to this lesson to hear that while Peter is addressing Jewish-background believers, he is not saying that there are differences between Jewish and Gentile believers in the Church Age. See that these verses are used by Replacement theologians to say that the Church has replaced Israel. Learn that the words Peter uses here to describe these Jewish believers come from the Old Testament but are applied to the Church. See that there is unity in the body of Christ that makes no distinctions.